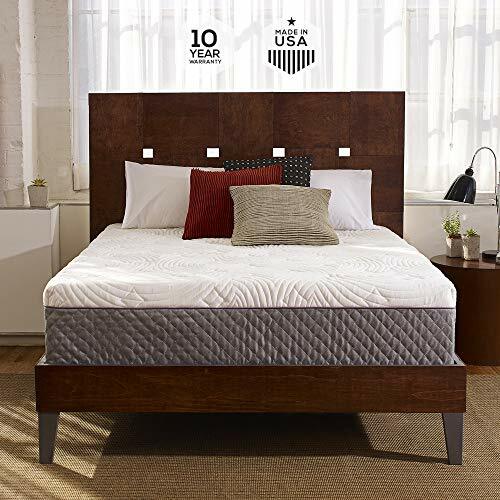 Buyers have many good things to say about the Sleep Innovations 12″ Sure Temp Memory Foam Mattress, mostly that it is one of the better mid-priced memory foam mattresses you could buy. The US. made memory foam mattress uses open cell technology for breathability in the entire mattress, so that the buyer gets a full nights rest without getting too heated due to the materials retaining body heat. There are only 2 layers to speak of, one being 2.5 inches and the other being the 9.5 inch base. Despite lacking extra layers, the two that are there provide everything a user would expect from a premium memory foam mattress, right down to the 20 year warranty. Motion transfer is not a problem, and this mattress does a superb job of making sure that when two people are in bed they have their own specific zones without disturbing one another. The health benefits are readily available for each user, and it has a very nice feel to it that makes it worth the money you spend. This is just about the right price for a memory foam mattress with premium features that doesn’t over-complicate things with unneeded features. An affiliate of Sun Capitol Partners, Sleep Innovations is an unlikely competitor in a sea of sharks that has managed to survive and be stable despite earlier doubts. Though not one of the bigger brands, they hold their own when it comes to product materials and quality. Location of the company is in West Long Branch, NJ and was established in 1996. So they are very much the new kid on the block, but keep in mind they are a private company and information can be sparse at times for the public. As such there may be some questions about the long warranties they offer in comparison to a more established brand on the market. There is also concern that as a smaller company they may cut corners on some of the important materials used to produce their bedding, especially as a private company. These are all valid concerns, but to be fair to the company so far they have honored their warranties. As far as sales go, they are doing well, so they are not in any way close to folding and leaving in the middle of the night. It’s a good brand, but it’s not in the top tier of memory foam makers. This mattress is available in twin, full, queen, King and California King. Going by the queen size the weight is a nice hefty 93.9 pounds, with dimensions of 80x60x12. So it’s one of the heavier and bigger mattresses in the queen size, but that is also due to sturdy and quality materials. It’s 12 inches of memory foam with a 2.5 inch SureTemp 3 pound density memory foam and a bottom base of 9.5 inches of premium support foam. There is no gel, and it’s only 2 layers of foam with the most important part being only 2.5 inches at the top. Quality matters and the branded high quality matressess never ever let the dudes go with sleepless nights. They do manage to make it sure that the top memory foam isn’t the older heat lover that many have come to loathe, and the entire package has great breathability with the open cell technology. Quality is about on the above average scale and will not blow many people away, but will give them their money’s worth. Included is a poly cotton blend mattress cover that can be spot cleaned. Points however get taken away for using a cotton blend, and that may be why this particular memory foam mattress isn’t CertiPUR certified. The best features are actually the lack of features and its simplicity. With only two layers to play with there is a lot less going on that could go wrong, not that it is the norm with several layers-but with the 2 that are there, it definitely minimizes any potential problems if they arise. Another good thing is the poly cotton blend mattress cover that is of incredible quality, some may even say higher than the actual mattress itself. It’s one of the more luxurious covers you can get in that price range, but it does come at a cost of being made of cotton, and thus attracting some unwanted allergens and dust mites. The heaviness of the entire memory foam is a huge plus, and it is a lot sturdier than even the most expensive of the lot in the market. This is an attribute that shouldn’t be ignored, as it has the durable base of a brand new bed but still feels like a soft cloud once you sink into it. This is one of the better memory foam mattresses to get if you’re trying to convince a spring coiled believer to come over to the memory foam side. If looking for a mattress that has similar specifications and feel, then try out Best Price Mattress 10-Inch Memory Foam Mattress. Generic companies don’t exist in memory foam, so there is nothing particularly wrong with purchasing from this company. The only thing to really look out for is the thin 2.5 inches of memory foam, which is the premium layer. With the rest of the 12 inches just being the memory foam support base, this memory foam mattress has a higher cost per quality materials than many on the market. It’s a bit surprising to say the least, but it would probably be worth it to spend either less for a comparable mattress or more for a better cost to material ratio premium memory foam mattress. This product excels with being the simplest choice for buyers coming over from spring coil products, and not overloading them with options. Because they aren’t mass produced like some of the bigger name brands, these mattresses have stayed steady at the medium price point and are probably not going to drop. When making the jump from spring coil mattresses to memory foam mattresses, sometimes simple is the winner. This is about the simplest memory foam a buyer can get that is also of high quality, and performs as expected. Though buying from one of the newer kids on the block may scare away some consumers, the performance rating of this mattress is high and should not be underestimated when looking for something new. It’s a good buy, not great, but also won’t overload the senses of someone looking for a simple and comfortable memory foam mattress.